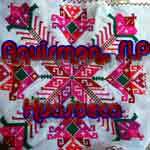 HUasteca Of San Luis Potosi, traditional dress and embroidered quechquemitls, hand embroidered blouses and bags, napkins and other crafts. Information about the Huasteca Language from the Summer Istitute of Lingustic Studies. The Huastecan peoples call themselves "the Teenek" which means "those that live in the country side with their language, blood and share ideas" In the State of San Luis Potosí they are located in 18 municipal jurisdictions centered around the Pancuco river basin. The largest concentrations occur in the following areas Aquismón, Tanlajás, Ciudad Valles, Huehuetlán, Tancanhuitz, San Antonio, Tampamolón y San Vicente Tancuayalab. It is believed that the Teenek are an extension of the Maya, they lived in what is now a 5 state areas known as "La Huasteca", no surprise there. The language is directly related to Maya. When the Totanaca and Aztec indains expanded the Huastecas were gradually cut off from the Yucatan peninsula. When the Spanish arrived the first encounters went badly for the Spanish and they were defeated, however by 1525 they had begun a war of extermination against the Teenek and established the hacienda systems as was common all over Mexico. The climate is tropical and as you drive along the green mountains and fertile valley are stunning. There are three important river systems the Montezuma, the Coy and the Tampaon. The primary economic activity is agriculture with most of the easy to farm valley lands in the hands on the Meztiso and the up hill areas farmed by the Huasteca. 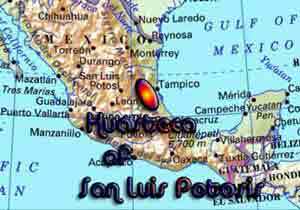 Today there are about 90000 Huasteca in the State of San Luis Potosi.